Call Us for an Emergency Locksmith. Locked out? Have your keys gone missing or need to be replaced? 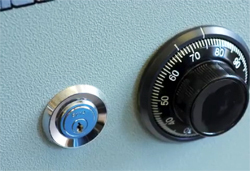 When you need an emergency locksmith for any residential, commercial or automotive key and lock situation, you need the help of a prompt and reliable professional. And that professional is owner Steve Stanley of Triad Lock & Key LLC of Jamestown, NC: a fast, affordable, trustworthy and courteous residential locksmith and commercial locksmith. 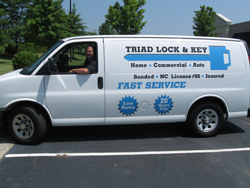 Triad Lock & Key LLC offers services for any of your key and lock-related residential, auto, and commercial problems. Need emergency lock opening or perhaps changing and replacement? Steve is the emergency locksmith who will respond fast and get the job done. Steve has been providing Greensboro, NC and the rest of the Triad Area with lockout service for over 25 years. He unlocks the problem and leaves customers completely satisfied with effective, guaranteed results. Don't get stranded without your car keys or house keys. Steve is always around to deliver the best service in a timely manner. 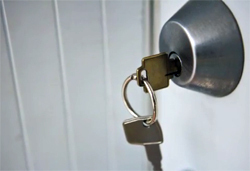 Locking yourself out or losing your keys can be a stressful situation. Never worry; once you've placed the call in to Triad Lock & Key LLC, we will have a replacement made in no time and you'll be on your way once again! Every business needs a commercial locksmith they can count on. 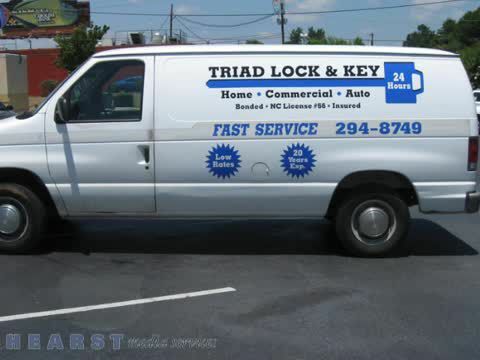 Anytime you are in need of a locksmith, trust Triad Lock & Key LLC to deliver the best service in the area. A fast and affordable residential locksmith! Safety comes first, and it's your safety that's first on our list at Triad Lock & Key LLC. When something goes wrong, Steve will be there as your emergency locksmith. Nothing provides greater reassurance than knowing the locks to your home, car and office are secure. As advancements in the industry occur, so do the solutions. Triad Lock & Key LLC continuously keeps up-to-date with advancing market methods and developments, to better conclude a situation most suitable for you. Whether it is a simple key or a master key system, Triad Lock & Key LLC will find the best fit for you or your business. Looking for a re-keying service you can count on? What if your key or lock doesn't work? Your best defense against premature lock failure and future duplication problems is to not get duplicate keys, but to ask for originals. Triad Lock & Key LLC can provide you the original Keys with our high-tech machines that always produce clean, exact keys which are identical to the keys that were shipped with the lock when it was originally manufactured. For perfect code cut original keys, talk to Triad Lock and Key today. If you're looking for an emergency locksmith, Triad Lock & Key LLC of Jamestown, NC will be there in no time, with the solution you need! Unlock the opportunities to your ultimate security and your safety by calling a residential locksmith or commercial locksmith at Triad Lock & Key LLC today! Proudly serving the entire Greensboro, NC region. Locks re-keyed, deadbolts & new locks installed, safe combination changes, master key systems, access control systems, exit alarms, lost keys made, locks repaired, ignitions repaired. 24 hour emergency service, low rates. Residential: locks re-keyed, deadbolts & new locks installed, safe combination changes. Commercial: locks re-keyed, deadbolts, master key systems, access control systems, exit alarms. Automotive - lost keys made, locks re-keyed, locks repaired, ignitions repaired. home locks, auto locks, exit alarms, commercial locks, locks re-keyed, deadbolts, locks installed, safe combination changes, locks re-keyed, master key systems, lock outs.